Prayer has transformed my life and it’s led me on wonderful paths that I never expected, but it hasn’t always been that way. It’s taken me a while for feel as if I understood prayer, and considered myself an praying person. Maybe it’s because of my misconceptions that I had since childhood. What are your first memories of prayer and how God works? Here are a few of mine that I shared in my book Blue Like Play Dough. When I was in the fifth grade, a friend stayed the night. Before we drifted off to sleep, Heidi climbed out of the bed, got on her knees, and prayed. At the time, prayer wasn’t a part of my nightly ritual. But seeing her there, it hit me that something wasn’t right. If God is God, then couldn’t He hear my prayers as I lay on my bed? Didn’t my whispered requests meet His ears, no matter what position I was in? I remember another time I prayed in the second grade for something I wanted. It was a book of Barbie paper dolls. You know—the kind with the perforated edges and all those cool two-dimensional clothes to dress that cardboard figure in. I desperately wanted the paper doll book, so I prayed. I told God He could make it appear, and I’d keep it just between me and Him. I made a deal, and I told Him He could drop it in my closet, and I’d only play with it when my mom wasn’t around. I prayed so hard and so long (for a second grader) that I was highly disappointed the next day when I opened the closet door and the paper dool book wasn’t there. 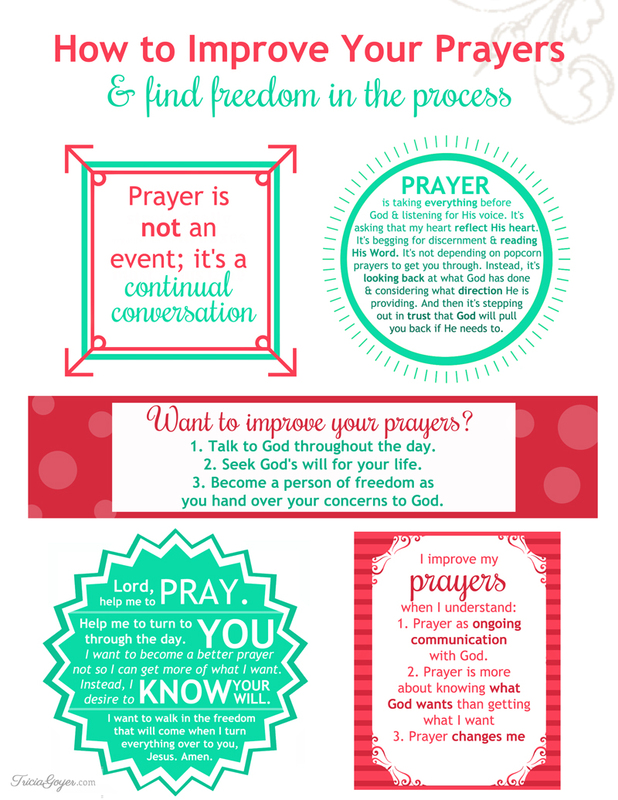 Looking back I can see a few misconceptions that I had about prayer. Misconception #1: Prayer is an event. When I saw Heidi pray as a child it confirmed to me that prayer was an event. I understood that I didn’t need to kneel to pray, but I did think it was something that I needed to tack on to my day. For years and years I saw prayer as an event. It was a time when I need to be still and come before God. There are times when I do that. I love quiet mornings on my couch. Sometimes I even get on my knees before Him, but I’ve grown to discover prayer is not an event; it’s a continual conversation. In the last week I prayed as I rode an ATV for the first time. (I prayed I wouldn’t die!) This morning I prayed as I watched my son drive away in the snow. (I prayed for his protection and for a bubble to surround his car from crazy drivers.) Last night, I prayed for a friend when she shared a need on Facebook. I didn’t wait until the next morning’s quiet time to pray. As I sat in front of my computer I closed my eyes for a moment, and I asked God to be with her and to give her peace. Misconception #2. Prayer is about getting what I want. As a young girl I learned the importance of prayer from Sunday School, but I thought that prayer was a way to get what I want. I wanted paper dolls, so I prayed. Later, I wanted a new outfit, so I prayed. In high school I wanted to make the cheerleading squad, so I prayed. Yes, God’s Word tells us to bring our needs before Him, but that’s not the only thing prayer is about. Prayer as ongoing communication with God. He’s our Creator, our Provider, our Guide. He is with us always, and we don’t need to make prayer an event. Prayer should flow out of every part of our day. Prayer changes me. As I pray in my day I see God there. When I lift up my thoughts and concerns to Him I invited Him to be part of my life, one moment at the time. I am changed because I don’t see my tasks, my problems, or my worries as my concern only. Instead, I hand those things over to God and I am changed. As I improve my prayers, my relationship with God improves. As my relationship with God improves I become a different person. Want to improve your prayers? Talk to God throughout the day. Seek God’s will for your life. Become a person of freedom as you hand over your concerns to God. Learning to pray has been a growing process, and I’m so thankful that God has been patient with me along the way. I’m a different person because of prayer. I’m thankful to walk in freedom, turning every need and thought over to Him. Lord, help me to pray. Help me to turn to You through the day. I want to become a better prayer NOT so that I can get more of what I want. Instead, I desire to know your will. I also want to walk in the freedom that will come when I turn everything over to you, Jesus. Amen. Download the printable and keep it nearby as a reminder! Very good post today. I need to pray to God more throughout the day. Shirley, just consider it a wonderful conversation! What a beautiful 3-step process. I love that it brings freedom. That’s something pretty much all of us crave. Hope you don’t mind, but I shared one of the pictures (and the link to this article) on Facebook. I don’t usually “steal” pics, but the “conversation” one was too pretty and truthful not to share. 🙂 Don’t worry; I made sure it linked back to the source. Andrea, share all you want!! What a great post. I just finished the new Max Lucado book on prayer and this was a great resource to go with it. I’ve always thought of prayer as not my strong point. I am always telling others and my children, when you pray your are just talking to a friend, your words don’t have to be fancy. At the same time, I feel my prayers are lacking, not that that makes any sense, lol. I love how you say: Prayer as ongoing communication with God. He’s our Creator, our Provider, our Guide. He is with us always, and we don’t need to make prayer an event. Prayer should flow out of every part of our day. I’ve often felt guilty for not carving more time out in my day for just prayer, instead usually shouting out prayers here and there as the need comes. Thanks for the reminder that God hears those prayers too. Thank you for a very thought-provoking post. Also thank you for the downloads to help me remember the main points. Visuals are a great help when I am facing times of stress. Since this post is on prayer, I will ask you to pray for my husband. He is having surgery tomorrow for a serious MRSA infection that has taken up residence in the bones of his left foot. We are praying the doctor will be able to clean out the infection and not have to amputate his toe and part of his foot. Thank you for the time you devote to this blog. It is always an encouragement. Shirley, I’m praying for your husband!! I pray for the doctors, for healing, and for your peace! Thank you for your prayers. In this situation we can’t have too many prayers. I can’t download the free printable version of prayer as mentioned above. All I can say is Thank You. Thank you for the inspiration!! and…I forgot to include… How is your husband?